The ColorCodeObs and ColorCodeObsByGroups modules color observations by calling the SetMarkerColor method of the DataObject class. While these module are often convenient to use, sometimes you might want to color markers according to some criterion that is not covered by either module. In this case, you can use the SetMarkerColor method directly. The SetMarkerColor method changes the colors of specified observations. It is usually used in conjunction with the GetVarData method of the DataObject and the SAS/IML LOC function to find observations that satisfy some criterion. As an example, suppose you are interested in the size of the eye of a tropical cyclone. (The eye of a cyclone is a calm, relatively cloudless central region.) The Hurricanes data set has a variable radius_eye that gives the radius of the cyclone’s eye in nautical miles. The radius_eye variable has many missing values, because not all storms have well-defined eyes. You can use the SetMarkerColor method to visualize the observations for which well-defined eyes exist. The first statement uses the special keyword OBS_ALL to set the color of all observations in the data set to black. The GetVarData method of the DataObject copies the values of the radius_eye variable into a SAS/IML matrix called rEye. The LOC function is then used to find the indices of missing values in the rEye matrix. If at least one element of the matrix satisfies the condition, then the SetMarkerColor method sets the color of corresponding observations to green. 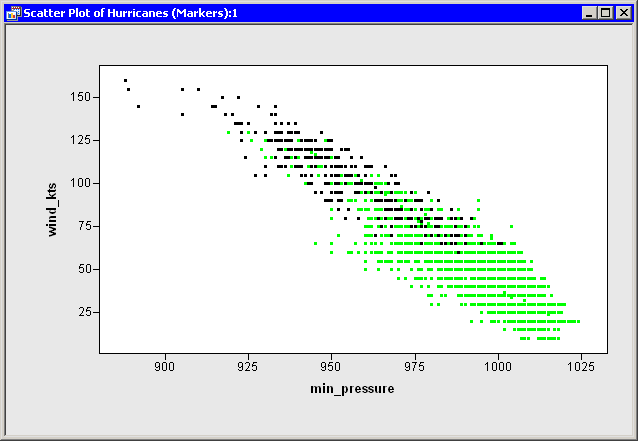 You can see from the resulting graph (Figure 10.3) that very few storms with low wind speeds have well-defined eyes, whereas most of the intense storms have well-defined eyes. Of course, you could repeat this process for other conditions you want to visualize. For example, you could locate the values of rEye that are greater than or equal to 20 nautical miles and color those observations.